You too can have an Erasmus. Although Erasmus passed away in January and since then we scattered his ashes, his image has been used around the web and he has become more famous than he ever was. I am very happy to announce that he is now available to everyone who has an iphone. Then finally I was contacted by PKMousie on Flickr. They asked to use a picture of Erasmus for a new application called ipurr (this links directly to the itunes app and will ask you to launch itunes). I accepted because they asked so nicely and I have since re-hacked my iphone with the newest version of firmware, installed ipurr and its wonderful. I have Erasmus back and purring at me. Well not exactly but it is the very next best thing and because I know he had so very many online fans some of you can have him too. Friday night I got home to find Jasper in a funny old mood. Scotty had told me he was miserable that morning when he got up. He just looked moody and very fed up. Well, that evening I wrapped him in a blanket and sat him beside me for the whole evening. He was not even stopping me fiddle with his back paws. Something was wrong and it was obvious because he did not touch any food or water all evening and only water in the morning. We tried to make him walk about but he was so very uncomfortable he walked 3 paces and sat down. That was it, I called the vet and took him in on Saturday morning for a checkup. Neither of our cats have ever had a hairball and we found this most surprising after Erasmus was a regular twice a month hocking up at 3am at the end of the bed. Always on the carpet. I tried to get Jasper in the cat carrier and waited for him to go pee first. Very kind of him to make sure he was ok for the car journey. Otis jumped in the cat carrier and would not get out. I ended up taking them both to the vet and I swear Otis just went along to keep his brother company. The checkup went ok, Jasper had a bit of a temperature and a very sore tummy that he would not allow her to prod properly because he tensed up. I was supplied with some antibiotics, some liquid paraffin and he was given an injection and sent on his way. My purse is now £50 the lighter but within the hour of getting medicine and getting home he was walking about a bit more and purring. I’ve kept up the meds and this morning (monday) Jasper was back to his old self fighting with his brother. I’m still checking the litter to make sure he goes properly, which I think is going to take a couple more days to clear up. Scotty and I did make it in to the back garden to hang out washing and do a little weeding in the afternoon sunshine. The rest of Saturday was spent on the sofa curled up with Jasper, knitting and complaining about my period. I’m really not sure the pill is helping them, but its worth a try. I just have to wait for my body to get used to them. Sunday was more productive, more washing and a visit to my brothers house for a bbq in the rain! It always rains when we bbq at my brothers house. Or it has at least the last 3 times. Dad was there as were the rest of our family and some of my sil’s family too. We left quite early because we wanted to make sure Jasper was not being a, beaten up by his brother, b, eating ok and c, walking about. I so need a cat cam for all the rooms in our house. I’d have them on live feed all day. Finally on to knitting. I’m making a secret scarf for Eve…. well not so secret now I have said something here. Eve: If you’re reading look away now! Anyway, its on ravelry and flickr and its very pink and in pure cashmere and be a you tea full. This is to say thanks for the cake, nearly everyone else who helped has been given some knitting in the past. This one is very special and will hopefully have a little leaflet with its history in it too so that it can become more of an heirloom for her daughter. It has taken an absolute age to knit Scotty’s socks I started them nearly two months ago. Finally late Sunday I finished the main pattern and moved over to the final ribbing for the cuff. I just cant wait to get this one off the needles and washed and on his feet. Next time I’m using sport or DK to knit man socks. 64ST in the round, was I mad? YES. yesterday…. and my wedding day. as in the real yesterday I was feeling down when I started work. I honestly did not know what good I could be to anyone. Because of this I knew I needed something to cheer me up. Plus now I don’t need waist length hair I booked myself in for a haircut. It was well worth it and has left me much happier and feeling more like Mrs M and less like Miss T. It is amazing how much a simple thing like a haircut can spruce up your feelings. So yes, I suppose now it is on to the most important day of my life so far. I’ve been wanting to blog this for over a month now and yes, we’ve already reached our 1 month moniversary (?). Date wise, that is today. Week wise it was on Saturday. Now appears to be the best time to do it. I’m going to wibble on about the finer points of the day for ages. If you cant take that much text the link to the photos of the day will be at the bottom. I’ve collated them all in to one big album. I do not have any images of me getting ready. It was not one of those sorts of weddings. I wish I could have had my family around me to get ready for the whole morning but it was not meant to be like that for me. Firstly I stayed home the night before the wedding. I wanted to make sure I slept well and no silly little superstitions were going to stop me having my own bed and my husband to be at my side. We woke early and snuggled for a bit, realising this was the day. We had a long holiday in front of us and a great big party to look forward to. As I stepped out of the house I decided from here on in there would be no stress, there was no point stressing and being happy with what I had was what I was here for. I drove up to the office car park and made my way to my hairdresser in town. Emilia is her name, Polish in origin and very lovely and pretty woman. A touch on the wild side but mighty entertaining. The issue was this very morning she was very very hungover. She was late. This did put me on the back foot for a moment but when she was there she was very good. Emilia did go to throw up once because of her very hefty hangover but still managed to finish my hair before I was due at my next appointment. Wishing me all the best she dashed back off to the bathroom and a large glass of water. As I was back early I got the car back in the garage and shouted up to Scott to see if he had time to sit down with a cup of tea with me before my nails and makeup. I felt very odd with my hair up and nothing else done. Luckily Scotty does not hold with traditions either and was happy to have a cuppa. He was rattling around the house on his own waiting for his brother anyway. I walked around to my local beauty parlour which appear to be everywhere in a city like Norwich. The ladies there had seen me last Thursday and were super excited for me and built up the mood nicely. Between having my nails and makeup done they commented that the hair was fab and enjoyed going through my photos of my cats and family on the iphone. I’ve found the phone invaluable for holding photos since. After that it was almost 1pm I walked back home where my friend Di was waiting with stuff in her car. We picked up the flowers and everything else I needed and headed on to Dragon Hall. When we got to Dragon hall I assisted setting up the flowers so that Di could copy and make all the small vases. I headed to the “event room” which was my private room for the evening. Everyone was getting things ready and it was all coming together better than I could have hoped for. My family turned up in stages, my sister first to assist with getting me dressed and ready. She also helped me put together my bouquet which was freesias in the middle with eucalyptus surrounding and around that my 6 felted tulips. Mum came in next and joined in with us watching as I got ready. The closer it got to 3pm the more I needed some lunch! finally my sister in-law turned up with a sandwich. I downed it and was then able to get my dress on. Di left and texted me she was all done, My family were here and it was all about to happen. The bridesmaids all looked beautiful and they all had their felted flower each. I was amazed how much they all matched each other. Considering I’d given almost no instructions to both sides of the family just to get the girls dresses. Neither sides of the family speaking to arrange anything. They all matched in such a lovely gentle way we could not have planned better. My most heartfelt thanks to the girls mums for sorting all that out for me. The rest of the day is almost a blur now. I do remember lots of small bits but not as detailed as before. I had to wait in the shop for a couple of minutes whilst being asked the questions like, how old is Scotty? can you confirm your name, age and foot size, well alright not really the last one but they were making sure we were who we said we were. The registrars were great. Very gentle and supportive throughout the ceremony. I was told it was time and apart from trying to send in all the bridesmaids before me dad then trod on my train and because my dress was poppered in to place several of the poppers popped. I spent most of the day popping in and out of place. It added to the fun. When I saw scotty all my happiness bubbled up and I was starting to get a bit shaky. I held it together, I wanted to say fancy meeting you here but it was so inappropriate. He looked stunning and very dashing. We recited our own ring words and I stumbled a little but they could be heard by all our close friends and family and loved by all. We signed the register, got our certificate and moved down stairs to get a glass of champagne, well of cheap bubbly because I was not going to spend that much. By this point I got a chance to speak to my family and Scotty’s family and our close friends. It was lovely to see some of them because of distance and time many of them have been in minimal contact for some time. Around 6 Andy turned up with his drums for the kids. This went down an absolute storm and ALL the kids young and old enjoyed drumming, it went on most of the evening. The food was served around 6 too. This was also extremely tasty but I’m not sure if it was nerves or the tight corset or just because, I found it hard to eat anything even though I did try. More friends turned up, although not the numbers I expected. There were a lot of people who ducked out at the last minute, it did not worry me because those I wanted and needed close for the wedding were already there. My best friend from college age Eve promised to make the cake. It was impressive, beautiful and just so very me and Scotty. Eve has known me for a lot of years and the description of 3 layers with descending blue shades to match the invites and cascading simple flower shapes in shades of blue from a few on the top to lots at the bottom as if they had been sprinkled. Also the cake was divine, I don’t normally like fruit cake but the fruit two layers and the top lemon sponge for the kids were all perfect. Now all this sounds so sickly sweet and idyllic, in many ways it was but it was also because my close family knew that mum was fading fast. Everyone was relaxed and enjoying everyone elses company and taking a chance to interact and share. Although looking stunning and behaving almost as if nothing was wrong mum needed a wheel chair for the first time. When my family all decided to leave around 9 ish I tried talking to mum other than the pleasantries and group conversations earlier. It was not to be, Mum said one last thing to me. “Don’t worry, please go and enjoy yourself and I’ll be here when you get back” and with that she was whisked away to take some rest as the meds were kicking in. From this point on, just about all the family evacuated in one big swoop leaving “us kids” which quite funnily was the adults too without kids or parents or grandparents to look after, to partay the night away. The disco was in full swing although not many were dancing. Thanks go to Edd who performed so very well for us and was the perfect disco host accepting all requests. We had our first dance which was Al Green lets stay together. Very romantic. Not long after I was starting to fade and the realisation that I was probably not digesting what little food I had eaten (and had a fair few glasses of wine with lemonade), seen everyone I love all in one place just for me and Scotty. I retreated to the main hall and sat at a table holding court in Dragon Hall, dressed in my finest like a lady of high class I had friends all around taking in turns to chat about everything and I tried to explain why I was becoming drained. Then it dawned on me. I just made one of the best days of my mum’s life. People told me she was proud of me and that I had achieved everything and more I could have hoped for in a happy day. Still I’ve had no chance to mention all the other people that helped make it a great day. we were escorted by friends to our home happy knowing that we got our fairytale wedding. Oh yeah… and that WAS all my own hair. This hopefully is the last back post prior to the wedding. I forgot to post it before the wedding post. Everything got a little confused in my drafts folder. Today I drop off the cats at their cattery for the duration of our honeymoon. The place is beautiful. With a pond that the cat gazebo looks out on to. There are wild ducks in the area and also an alpaca farm next door. Very plush indeed and they already seemed to like it before I left. I went on to my dad’s birthday party. I left Scotty at home to catch up on packing. It was lovely to see my entire family all at mum and dads house. There was a very tasty lunch and everyone was excited with tomorrow being the big day. I remembered my fathers present and made sure I stayed long enough to chat to everyone. I left before everyone else because I had another birthday party to get to and my packing to complete. WARNING SAD MOMENT…. last thing before I left dad came out to the front door step to see me off. He confirmed my fears and said, mum would be at the wedding but there was a very high chance she would not be there when I got back. I knew this. My brother made me aware and there was nothing else to do but see through everything we intended on doing. This was one of mums last requests. I didn’t have much chance to talk to mum direct about it but it was because there was so many people around. Plus I was not entirely sure mum was able to understand the situation completely, being stuffed full of drugs and with so much going on. It was sad, I didn’t want to have my dad crying on his birthday but the things had to be said even though we all knew what was going on. Then after getting home and sharing my worries with Scotty we headed out to a Mexican meal for his dad’s birthday. This was also great to see his entire family. Everyone around one table enjoying the meal. The normal questions passed, are you nervous, can you wait for the holiday? etc etc… Then Scotty’s mum said something that I struggled to answer. So when are you two going to try and have kids then? I felt awkward I had to say something. I did not mention that I’ve just had to come to terms with my mum passing very soon, I tried to keep it more on the fact that we were not quite married yet and give me around 5 years and we’ll see. I always expected my mum to be there when I had kids. Now this is not the case, I do have the experience of my brother and sister, still I can see that they had her help every step of the way and I wont have that. Most painful at the time but hopefully this sort of thing will ease with time. There was little sleep because I was just too excited, and no cats in the house so it was not quite the same. We knew it was a strange night. Bags were mostly packed but we knew we were coming home again so it did not matter. One last re-cap prior to the wedding. My manager Nadine visited the office on Tuesday 19th. She took me for a lovely lunch out. I was surprised at how much she expected me to not bother achieving in the way of work when she was around. Also they had a small announcement and I was expected to make a speech for my present…. which was vouchers! Just what I needed. I gained £140 which was great, no fantastic. Much more than I ever would expect from a work collection. I came in to work for my last day as Miss Tedds. My desk was decorated up and looking quite fabulous. I had a massive plan list for Thursday but it all went rather wrong. I had to pickup the fountain chocolate, which would have been fine but… As I closed the door I locked myself out of the house. I knew I had time to relax and get on with things so for the time being it was not urgent. Instead I went on to get my makeup trial and leg wax. These both went very well. Because I had my car keys and purse I was able to go and do other things. I went to town and checked on the flowers. They were ready to pickup BUT I could not leave them in the car for long. Plus the chocolate would melt… By this time I needed to get home. ALL of the female inlaws were heading round for dinner (6 of them) and the place was a mess. I drove over to Diss to get the house keys from Scotty. 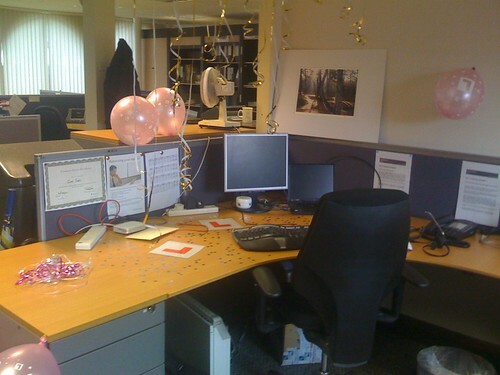 He had to stay at work even though it was his last day. I drove back and got the flowers then got back in the house. I cleaned like a mad daemon and finally was ready for it all. The evening with the ladies (and girls) was lovely. We had takeaway and relaxed whilst Scotty was being dragged around town by my brother, his brother, his dad and my brother in law. One of our old friends Adrian also came along because he was going to miss the wedding. He stayed over, and luckily there too I had clean sheets on the spare bed. All most exciting and seeing Scotty come in slightly drunk and with a banana painted on his head was well worth it. I was glad he finally had a decent stag do. I hate feeling guilty that I’ve done no updates for a while. Plus considering I have over 15 drafts for the wedding, the honeymoon and since then too. Thing is, its nice to have the items there and I do need to flesh them out and get them posted, but and its a biggie, I’m not sure I’m ready to let it all out to the big wide world. There is also the fact that my family know its all here and can read it and although most of them don’t I don’t want to upset any of them either. They have had to live with all this too and being honest and out there with all the things that have affected me may just make them a bit sad, or just generally wish I never posted it. so that is my dilemma. Just so as those that do read and care and wanted to know, because there are a few I know of, we’re fine. Coping better than expected. Back at work and working hard with still far too much to do. I did manage to get some knitting done whilst away and on leave, now its stopped because I’m too tired and sore shouldered from work. This morning I had a docs appointment. I have a mole on my face that I have caught a couple of times recently and I would like it removed. It looks like generally as long as its not cancerous they leave it be and its not available on the NHS, and classed as cosmetic. So far though Both my doc and I think its fine, just been caught a few too many times. Otis and Jasper had a lovely time on their hollybobs plus they came back happier than they were before if that could ever be possible. Anyway over and out for now and I do want to review what happened I’m just not sure when I will be able to face what emotional joy or despair that I had at the time without wanting to run away. I was at work, got changed in the ladies. Later found out that the ladies had placed flowers in the other bathroom Doh! It was all a big surprise nobody let on at all what they were going to do. We went down to Roccos on prince of wales road. We supped from pitchers of pimms. There were around 15 of us. Some left and my family turned up, just my sister and sister in-law. After we drained 3 or was it 4 pitchers between us all we walked down to the river. By this point someone had mentioned boat and Thai and we ended up in Thai on the river floating boat restaurant. The most perfect thing was just behind where I was sitting I could see the back of Dragon hall where I will be getting married. The food was delicious. The company was great and everyone enjoyed it. As the meal was winding down most people had things they needed to do, kids and family to get back to. I checked with Becky and Tommy is better than expected healing well. The stitches have done wonders. Once we all disembarked the very steady but wonky staired boat, there were just 3 of us left. Me, Di and Allison a lovely secretary in our office. We went as far as the cash machine to top up ready to hit the town and we were “chatted up” by a rather inebriated sort and it put me right off going to a club and standing around in semi darkness with thumping noise and shouting to be heard. I asked if we could go to my local for last orders and they both agreed that it was a great idea. We grabbed a taxi back on riverside and made it just in time to get in a peach beer. Walked in to the back garden to find a house warming party of men dressed as ladies. I say men, but when we enquired as to why they looked like teenagers they all said they were under 25 but over 18. They were all wearing mostly skimpy dresses and we were introduced to them by one wearing probably the most covering and more becoming underwear lifted his leg on the table to ask if we had a light. His dress hitched up and all I remember was the shape of the hammocked package looming underneath the dress. I was left lost for words and giggling. When later we noticed most of his friends were wearing G-strings and thongs we were much happier having the first bloke greet us in this way and not them. As it was staggering distance to my front door, Allison and Di called their men and let them know to pick them up etc, they both came back for a cup of tea and a stroke of the cats. Now that is what I call a good hen night, by the end of it I was very very happy and not the worse for wear. Although I did spend most of Saturday mooching like I had a hang over, it was not all that bad considering wine with dinner, pimms, beer. thankfully I was far to sensible to head towards any shots and I can remember it all. A very wonderful hen night. You are currently browsing the Jiva a soul in transit blog archives for September, 2008.